Actin pedestals are raised actin structures formed by the dynamic polymerization of host actin, induced by effector proteins secreted by extracellular pathogens like Enteropathogenic Escherichia coli (EPEC) and Enterohaemorrhagic Escherichia coli (EHEC). Infection by EPEC and EHEC induce attaching and effacing (A/E) lesions on the intestinal epithelia causing destruction of nearby microvilli. EPEC and EHEC have developed antiphagocytic mechanisms that prevent their uptake into the host cell. This is mediated by the bacterial virulence effector EspG. EspG blocks actin polymerization regulated by the WAVE regulatory complex (WRC) through its interaction with either Arf6 or Arf1, eventually preventing Rac1 activation, WRC recruitment and actin polymerization . Actin pedestal formation by EPEC and EHEC follows injection of Tir into the host by the bacterial T3SS. Tir translocates to the host membrane. Bacterial adhesion protein intimin binds the loop region of Tir that projects into the extracellular space, thus anchoring the bacteria firmly onto the host cell. The N and C termini of Tir facing host cytoplasm invokes actin phosphorylation through distinct mechanisms in EPEC and EHEC. A. NIH3T3 cell infected with GFP-EPEC. Red- Host actin. Image is taken 5 hours post infection. 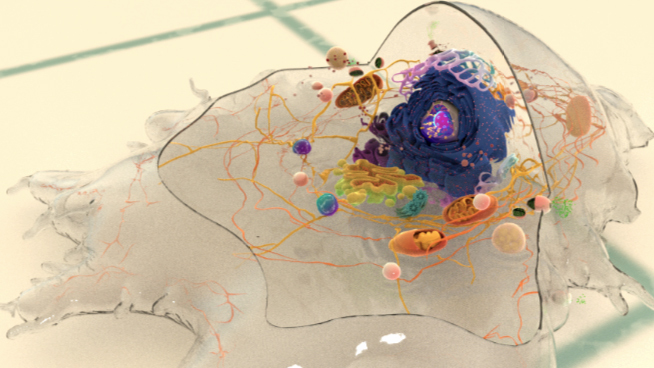 Image captured by Mrinal Shah of Linda Kenney lab, MBI. B. Actin pedestal formation in EPEC is mediated by the phosphorylation of Tyr474, recruitment of Nck, N-WASP and Arp2/3. C. In EHEC, the dimeric IRSp53 protein binds the Tir and recruits bacterial EspFu. While EPEC and EHEC block actin polymerization related to phagocytosis, interestingly they invoke actin polymerization at the site of their attachment to the host cell resulting in actin dense structures, providing an intimate host-pathogen interaction referred to as actin pedestals  . EPEC and EHEC employ Type III secretion systems (T3SS) to inject translocated intimin receptor, Tir, into the host. Tir has a loop-like structure and inserts itself into the host plasma membrane with both the C- and N-termini facing the cytoplasm. The loop region is exposed to the extracellular space and binds the bacterial A/E protein intimin . The interaction between Tir and intimin anchors the bacterium to the host membrane. The downstream pathway driving actin polymerization is unique for EPEC and EHEC. In EPEC, the tyrosine residue (Y474) at the C-terminal tail of Tir is phosphorylated by host kinases Fyn and Abl , resulting in the recruitment of the host adaptor protein Nck that binds directly to Tir , . Nck then recruits the host actin nucleation promoting factor N-WASP, which in turn activates the Arp2/3 complex resulting in actin polymerization. 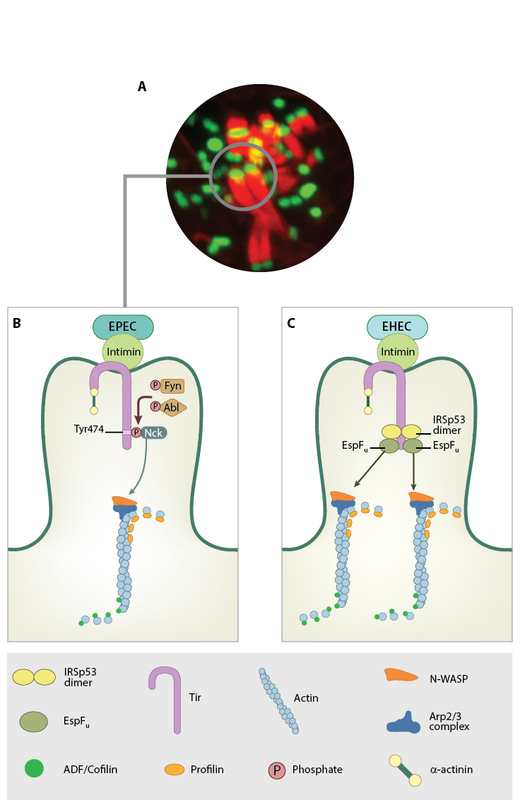 In EHEC, the Tir tyrosine phosphorylation step is bypassed by EHEC effector protein EspFu. EspFu binds the host membrane remodeling proteins IRTKS and IRSp53 that enable its binding to the Tir receptor  [Reviewed in . Signaling is then initiated from the Asn-Pro-Tyr motif at the C-terminus of Tir, which recruits N-WASP and Arp2/3 required for actin polymerization. Apart from actin and actin-associated proteins, focal adhesion proteins (talin, vinculin, alpha-actinin, etc) are also localized at the pedestal sites   . The pedestal is similar to adhesion structures like focal adhesions, podosomes or filopodia in mammals. The similarities between actin dense structures in bacteria and mammals will provide insight into force generation from cytoskeletal organization, cellular motility as well as pathogenesis.